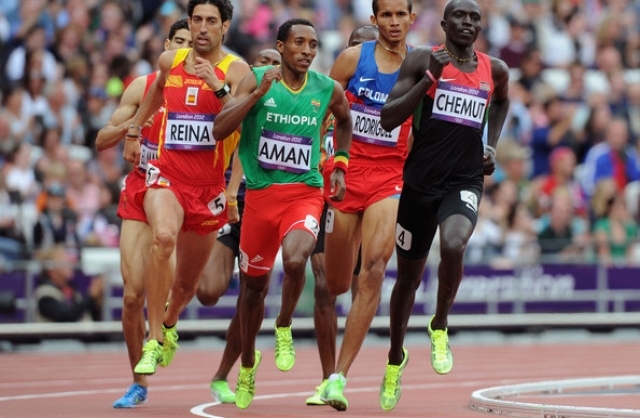 MOSCOW — Mohammed Aman of Ethiopia won the men’s 800-meter gold medal Tuesday at the world championships. The 19-year-old indoor world champion surged ahead in the home stretch to beat Nick Symmonds of the United States. Aman had his best time of the season — 1 minute, 43.31 seconds. Symmonds finished in 1:43.55 and Ayanleh Souleiman of Djibouti took the bronze in 1:43.76. David Rudisha, the Olympic gold medalist and defending world champion, has been out injured for most of the season. Aman won his last half dozen races and has beaten Rudisha twice. Tirunesh Dibaba regained her IAAF World Championships 10,000m title after a six year hiatus with a blistering 59.96 last lap to shake off all challengers and win her third title in 30:43.35. 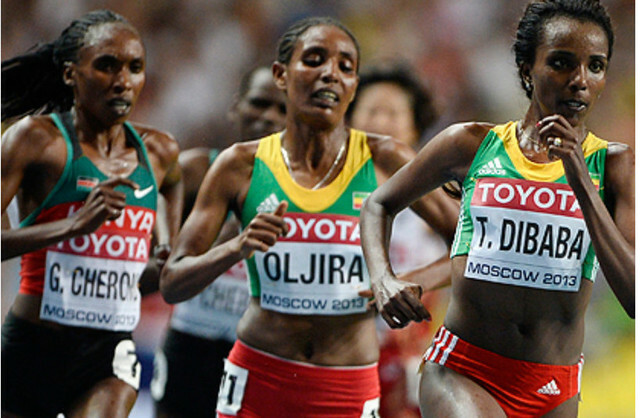 The victory in the Russian capital also maintained Dibaba’s unbeaten streak over 25 laps of the track: 11 races started, 11 races won, a record that also includes two Olympic titles in 2008 and 2012. As the race developed, it became ever-more apparent that there could be only one winner, in the absence of her team mate Meseret Defar, who has decided to concentrate on the 5000m. Just like at the IAAF World Championships in Daegu two years ago, this event boiled down to a last-lap battle between Great Britain’s Mo Farah and Ethiopia’s Ibrahim Jeilan, but this time the roles were reversed. In 2011, Jeilan had enough speed to be able to run a 52.8 final 400m for victory and thwart the man who was to win the 5000m in Daegu and then go on to take double gold at the London 2012 Olympic Games last summer, but Farah this time produced a 54.5 last lap in hot and humid conditions. With the thermometer reading 27 degrees Celsius, Farah was able to move away his surprising challenger, who had not completed a 10,000m in almost two years and who has only recently returned to form after missing the Olympic Games through injury and having some rather modest results this summer. Farah, like Jeilan a sparing racer over the longest distance on the track and running in his first 10,000m race since his London triumph, crossed the line in a Russian all-comers’ record of 27:21.71. He become the first European to win over the distance at the World Championships since Italy’s Alberto Cova at the inaugural edition of the championships 30 years ago in 1983.